Summary NIGHT AT THE MUSEUM: SECRET OF THE TOMB is the third instalment in the comedy adventure series about museum exhibits coming to life at night. 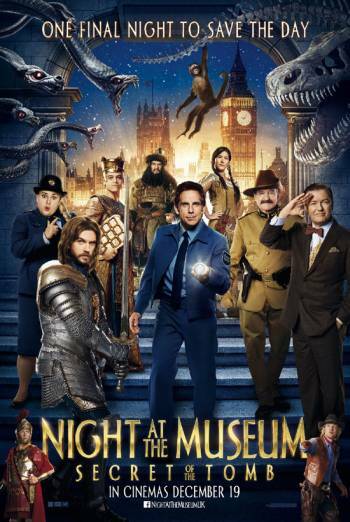 NIGHT AT THE MUSEUM: SECRET OF THE TOMB is the third instalment in the comedy adventure series about museum exhibits coming to life at night. There are occasional scenes of mild violence when characters fight fantastical creatures, although these sequences are often comic or slapstick in nature. There are occasional scenes of mild threat when characters are chased or become trapped in various situations, including a recreation of the destruction of Pompeii. There is infrequent very mild innuendo and very mild bad language ('hell'). There are two comic scenes in which a monkey urinates on other characters. There are infrequent scenes of dangerous behaviour, including a caveman running headfirst into a glass door, eating polystyrene, and electrocuting himself using a defibrillator and by sticking a knife into a microwave.